Alright, time for a ship featuring a different sort of gameplay. All three of the Mantis cruisers are based around using the Teleporter to board enemy ships and kill their crew. Eliminating the rebel marines without destroying their ship yields up a scrap bonus, as well as a greater chance to find new weapons, augments, and crew. The scrap bonus was about +50% in the pre-expansion days, when use of the Teleporter was arguably overpowered, but even in the Advanced Edition it still produces a noticeable increase of about +15% compared to normal. If you can successfully board the enemy ships and anniliate their crew, it's well worth the additional effort. And there are few ships better suited to doing that than the Mantis ones. The Mantis A therefore starts the game with a Teleporter, and you'll need to use it early and often. Unfortunately it is only the default two-tile Teleporter version, not the four-tile one that the Mantis B and Mantis C have on board. This makes the boarding gameplay quite a bit more difficult, especially in the lategame. 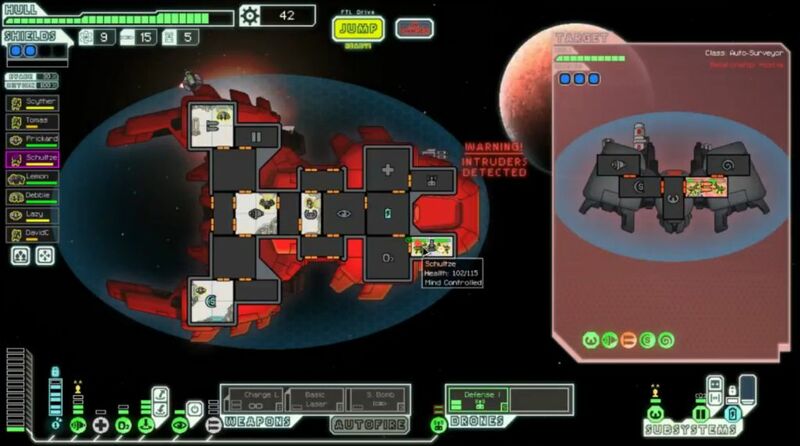 Nevertheless, the Mantis A has the good fortune to start the game with three Mantis crewmembers, making it relatively easy to send in all three of the bugs once the Teleporter cooldown cycles through. The Engi can stay behind to pilot the ship. (Make sure to swap the Engi into the Piloting room immediately at the start of the run! You don't want to waste a Mantis in there.) The Mantis A also begins the game with a weapon that complements the Teleporter very well in the form of the Small Bomb. Although the Small Bomb deals no hull damage, it's very good at knocking out targeted enemy systems on a relatively modest cooldown of 13 seconds. A successful hit will deal 2 system damage and has a chance to set fires, making it an excellent tool to knock out those pesky Medbays and Cloning Bays. Bombing enemy weapons and shields and even piloting can also be excellent targets. It's a very helpful tool to get kills in hand to hand combat. Finally, all of the Mantis ships also begin the game with the Mantis Pheronomes augment, which causes your crew to move 25% faster. This is also handy for the boarding gameplay, allowing your Mantises to run around in circles on enemy ships, avoiding combat when low on health and waiting to be teleported back for healing. If you don't find it useful, it can also be sold for 25 scrap. This ship is therefore quite good at boarding the rebel fleet and killing their crew. Unfortunately, it's pretty weak at doing anything else. The other starting weapon is a Basic Laser - not a Dual Laser, a Basic Laser. That thing fires 1 shot on a 10 second cooldown. 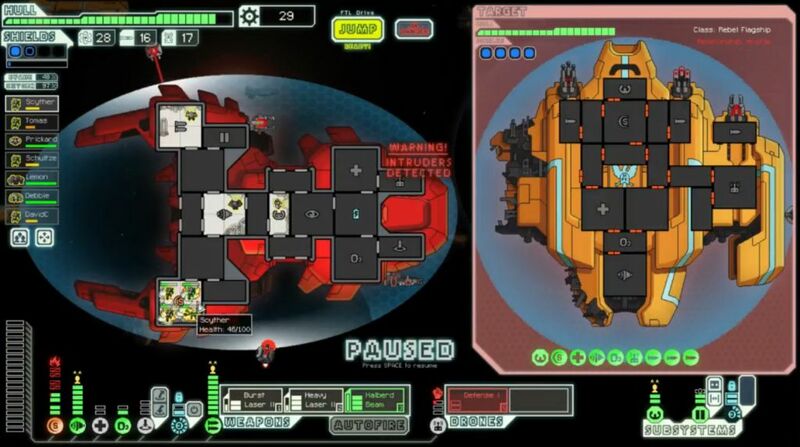 In other words, the Mantis A's starting weapons cannot damage any enemy ship with even one shield bubble! 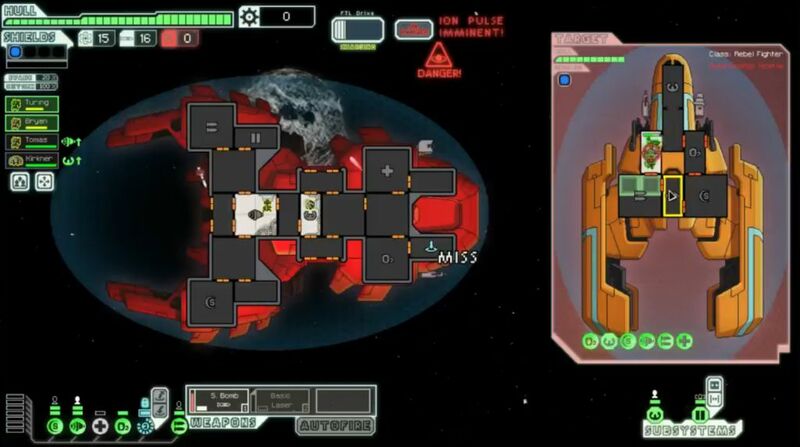 You have to bomb out the shields with the Small Bomb or use the Teleporter to board the ship. Needless to say, this can cause some serious problems, especially against auto scouts with no oxygen on board and no crew to attack. The Mantis A Cruiser furthermore has only three weapon slots, not four like most other ships, which strictly limits how many tools you can have on board. I've personally found the three weapons slots to be the single biggest weakness of this ship, and it does much to force you into using the Teleporter for lack of options with the traditional weapons. Finally, the Mantis A also has fairly weak starting system levels. It begins with only level 2 shields, level 2 engines, and level 1 weapons! The weapons system in particular requires a one-time penalty of 40 scrap to upgrade to level 2, and then the normal upgrades from there. But you can't even use both the Basic Laser and Small Bomb together at the start of the run, only one or the other. The designers truly want you to use the Teleporter with this ship. Mantis A also lacks any Sensors unit at all, which doesn't bother me much but can make things tricky for less experienced players who are forced to play in the dark. It's very possible to have half the ship on fire and not even notice it until your shields are suddenly engulfed in flames! Overall, I'd say that the Mantis A falls roughly in the middle of the ship tier list. It's far inferior to boarding ships like the Mantis B, and especially the overpowered Crystal B, while being a lot better than poor Slug B and Federation C. The Small Bomb is the saving grace of this ship's starting setup. Without that weapon on hand, the Mantis A would be a lot weaker. Let's get started then. The very first enemy ship of this run was quite nasty, and serves as a good illustration of some of the challenges you can run into with this setup. The battle took place next to an Ion Pulsar (which would quickly eliminate all shields on both sides), and the rebel ship had a Basic Laser, a missile launcher, three crew, plus a Medbay. This meant that I would need to power up the Small Bomb to take out their Medbay healing, leaving me with nothing to stop their weapons from firing at my unshielded ship! 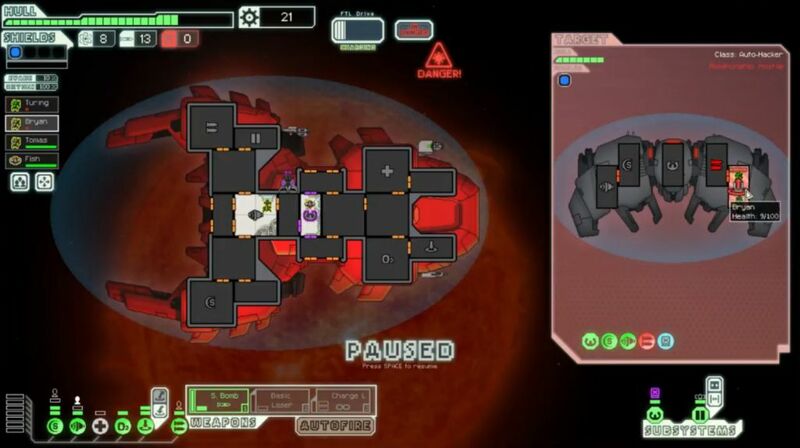 A single missed bomb on the rebel Medbay would have been completely disastrous. Fortunately the bomb did hit, and my initial Mantis boarding party of two were able to secure all three kills without further assistance. It was a surprisingly close run thing, and way harder than most of the encounters in the first sector. The next fight took place against an auto scout, revealing one of the other major problems for ships that rely on the Teleporter. Auto scouts have no oxygen on board and there's no crew to kill, making them a monkey wrench of sorts for this gameplay. The only option was bombing the enemy shields with the Small Bomb (which fortunately did hit), and then plinking away with the Basic Laser one shot at a time after that. This did work eventually, although not until the auto scout's laser + ion combo managed to get in several shots against my hull. Thankfully they didn't hit any systems of importance. My first upgrade with the Mantis A typically takes the Teleporter unit to level 2, which decreases the cooldown from 20 seconds to 15 seconds and allows you to get a boarding party out of an auto scout before they die from lack of oxygen. There's just enough time to do this, they survive with less than ten health. This second battle allowed me to purchase that upgrade, and I'd have an easier time against auto scouts moving forward. There was further good news and bad news in Sector One. The good news: I found a Combat drone after one of the battles! The bad news: I picked the wrong option in an event dialog and lost the Engi pilot. In a fit of disgust, I sold the Combat drone and Mantis Pheromones at a store, using the scrap to purchase the two-shot Charge Laser. Time to reinvent the Mantis A as an underpowered gunship! Relief came in the form of a new Human, who joined the crew as a victory reward shortly thereafter. By getting back up to four crew again, I had enough people to run a boarding party while still having piloting and engines manned. Whew. This had been quite an eventful first sector. Here's an example of the level 2 Teleporter in operation against an auto scout. Notice that there's JUST enough time to get your crew out before they suffocate to death. This is still a risky move though, in case you would suffer damage to your Teleporter and be unable to pull them out, or have any number of other things go wrong. I used the boarders to eliminate weapons, then shields, and then finally used the Basic Laser to finish off the crippled auto scout. It was not a fast process, and wasn't helped by the nearby sun setting off solar flares periodically. The net result was a lot of damage taken in the first sector (17 in all), while also picking up a large amount of scrap. With level 4 shields, level 3 engines, plus the Charge Laser that I'd purchased, I was in pretty good shape assuming that I could find a repair somewhere. 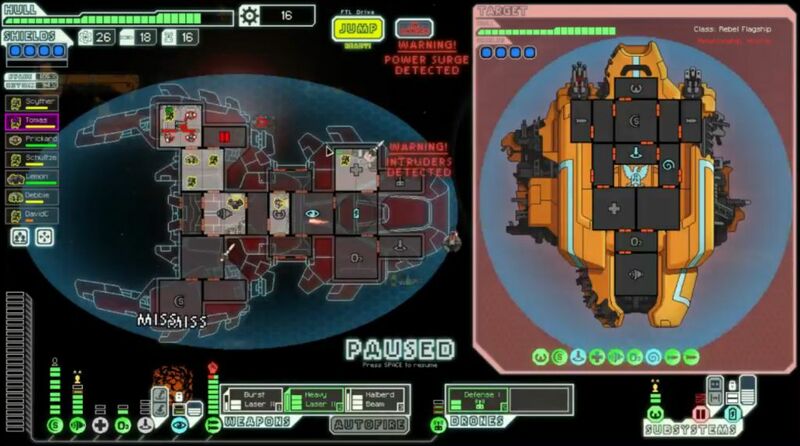 Sector Two was a nebula, and for whatever reason the enemy ships were mostly weaker here than in Sector One. Perhaps it was due to the extra levels in shields and engines, maybe not though. The rebel weapons simply weren't that bad. I caught a stroke of luck in finding another Mantis after defeating the crew of one of the ships, then a blue event from having the level 2 Teleporter gave me a Rock crewmember. Awesome! That was enough crew to run two boarding parties, a pair of Mantises jumping onto the enemy ship followed by two more Mantises once the Teleporter cooldown was finished. Now I simply needed some more non-Mantises to run the ship while they were off clawing rebels to death. I repaired at a store and picked up the Backup Battery there, putting my ship back into the green on health. At the end of the sector, another victorious encounter yielded up an Engi to replace the one I'd lost in an event earlier. Seven crew already! You do get more from using the Teleporter, but that was still fortunate. Sector Two was the area that kept on giving. If there was a turning point in this run, it was finding four crew in this span of about a dozen beacons right here. Then I spent almost ten minutes fighting an auto scout, which produced a grand total of 10 scrap upon defeat. The Mantis A does not like those auto scouts! 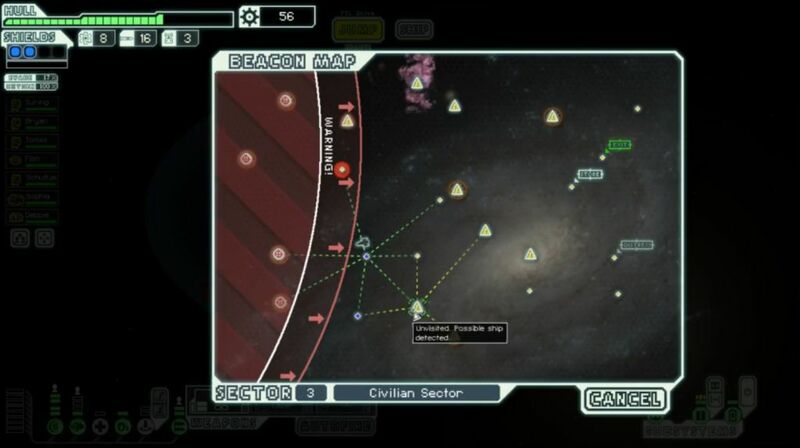 Sector Three was a civilian sector, and a map reveal partway through the sector allowed me to set a course for lots of encounters. I upgraded weapons at the beginning of this sector so that I could get the Charge Laser into play, and that made auto scouts significantly easier to deal with. Enemy missiles continued to bedevil me due to the lack of a Defensive Drone though. One thing about the boarding gameplay is that it tends to be somewhat slow, and you aren't knocking out enemy weapons in the same way that a laser gunship would be doing. This means absorbing a lot of punishment. Defensive systems are therefore critical on the boarding ships, both a Defensive Drone and Cloaking are highly recommended to buy time for your Mantises to chomp through the rebels over on the enemy ship. For offense, I had upgraded the Teleporter to level 3 and the shortest possible cooldown of 10 seconds. That allowed me to send in the initial Mantis pair, followed by a second Mantis pair immediately thereafter, and that was enough to win nearly all battles against non-auto scouts. Even ships that far outclassed me in conventional weapons and shielding fell readily to the might of the Mantis attackers. The Small Bomb continued to serve as crucial logistical support, knocking out a rebel Medbay in the picture above. I think this was a mistake that I made on previous runs, not upgrading the Teleporter to the max level fast enough. The critical difference here was having enough crew on hand to make use of that fast teleportation. If you only have three or four people on hand, upgrading the Teleporter isn't that useful since there's no one left behind to run your own ship. 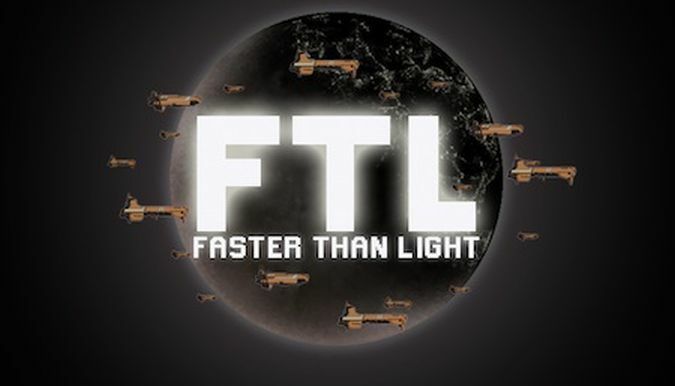 As is so often the case in FTL, I was able to snowball further ahead because I had the good fortune to find so many crewmembers along the way. A final random Human for the shield room had me at the maximum of eight. Sector Four was a slug nebula, and proved to be surprisingly easy to navigate. I ran into the slug ship with the two unconnected side rooms over and over again, which was a trivial battle to win. That ship design usually only has two or three slugs on it, and they died in seconds to the mantis boarding party. This was a nice sector for scrap gain. Towards the end of the sector, I was able to purchase a Defensive Drone (buying the Drone Control system and the drone itself in two separate purchases), repair the hull, and get shields to level 6 for the third layer. Now I was in great shape for the next few sectors, only needing to find a weapons upgrade and hopefully Cloaking to prepare for the eventual flagship. Except that three battles later, the postreward prize was a new Mantis crewmember, already with maxed combat skill! The four Mantis rockband was back and better than ever. 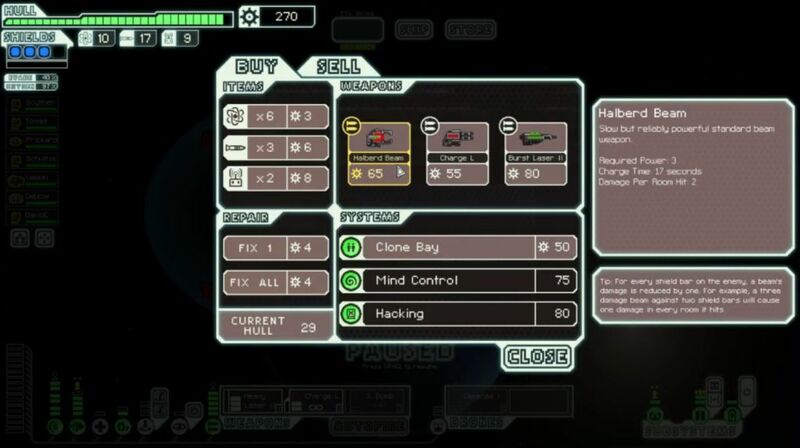 I spent most of the accumulated scrap from Sector Five purchasing a Cloaking unit at a store. This essentially completed the defenses that I needed to win the game. Next up were weapons, since a two-shot Charge Laser, a Basic Laser, and a Small Bomb weren't going to cut it against the rebel flagship. This was amply demonstrated in the battle against a nasty auto scout above, where conventional weapons were completely useless and I had to rely on using the Teleporter to (very slowly) deal damage to systems. The presence of an enemy Mind Control device made this much more micro-intensive and dangerous. I would eventually win this battle after ten minutes of real world time and effort, although at the cost of my shield Human. The enemy Mind Control hit him while he was over on the auto scout itself, and that prevented me from Teleporting him back to safety. I was pretty lucky that none of my Mantises ever died in this fashion. Probably should have just run from this encounter, to be perfectly honest. Better weapons please. A Burst Laser II AND a Halberd Beam for sale?! That was just disgusting. As the perfect weapons to complement what I already had, I snapped up both immediately, selling the Charge Laser in the process. This is why it's best to save scrap in FTL, since you never know when you might find the perfect stuff in a store. The one great caveat is that sometimes you CAN'T afford to save scrap, because it's more critical to upgrade systems immediately to prevent taking damage and/or outright dying. Knowing when you can and can't save scrap is one of the harder skills to master in this game. In a perfect world, I could have kept the Small Bomb in one weapons slot along with the other three weapons intended for use against the flagship (Burst Laser II, Heavy Laser II, Halberd Beam). 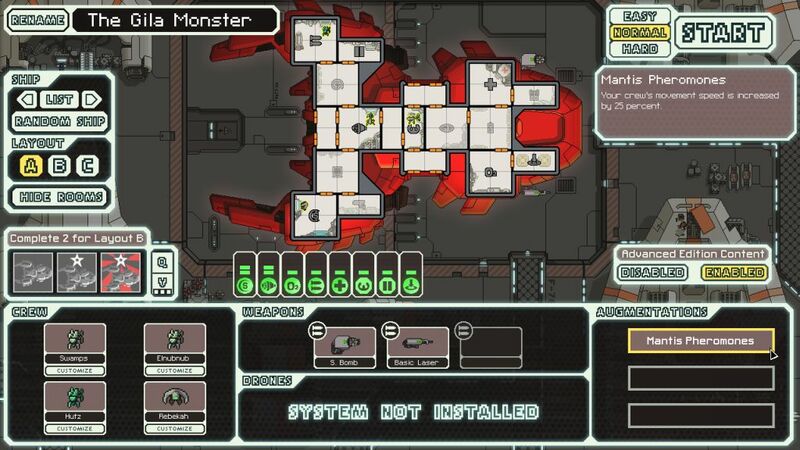 Unfortunately the Mantis A only has three weapon slots, which forced me to pick and choose. I kept the Halberd in reserve for now, continuing to go with the Small Bomb for use in assisting boarding operations. It still did a wonderful job at eliminating Medbays and such to allow my Mantises to swoop in and get the kill. One of the biggest downside to this constant use of the Teleporter was the time investment. These battles all required much more micromanagement and real world time compared to using gunships. Not only do you have to micro the Mantises in actual fighting, you also have to heal them after every single engagement, and all that adds to the burden. While it works quite well, it definitely starts to get tedious towards the end of the run. 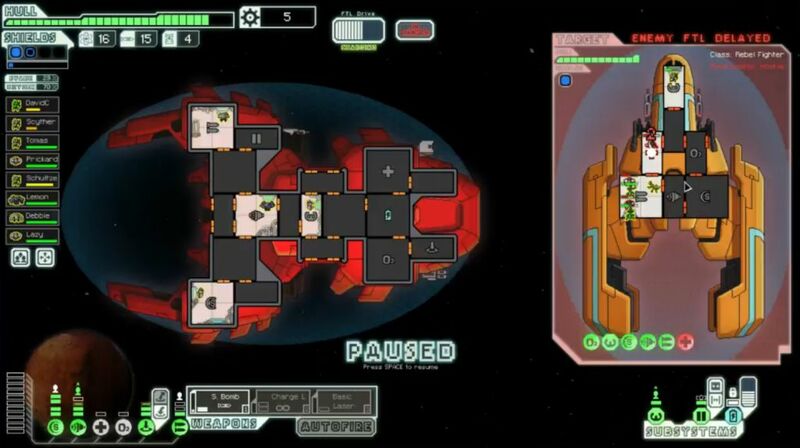 By the end of Sector Eight, after many many many fights, I'd managed to get both Shields and Weapons to level 8. The bonus scrap from getting so many crew kills really adds up over the course of a run. Several battles while heading to the Federation base gave me enough income to finish leveling up the odd systems like Doors and Piloting, along with damage buffering Cloaking and Drone Control. I was even able to take Engines to level 6, one level past the point of diminishing returns. For once, I'd have enough reactor power on hand to run just about everything in the final battles. Time to face the flagship. The rebel Hacking drone hit the Teleporter unit in the first phase. 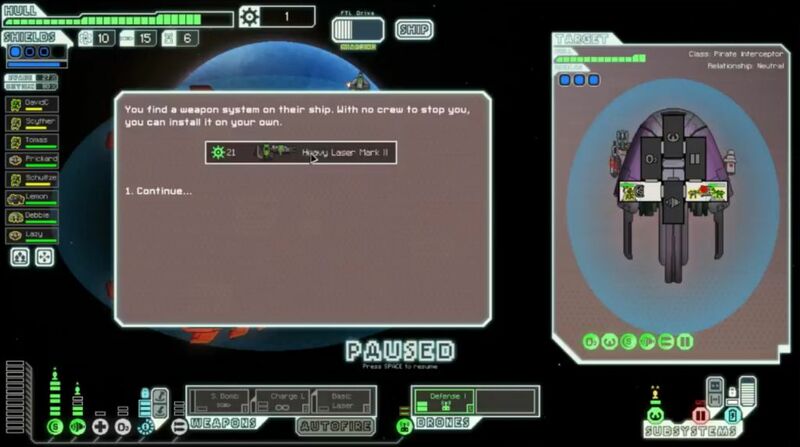 This discouraged me from trying to beam over to the flagship and kill the crew. I only like to go for that strategy with a ship that has a four-tile Teleporter, as otherwise the flagship's upgraded Doors make it difficult to get four of your boarders into one room together. Combine my hacked Teleporter with the flagship's Cloaking and Doors and huge Medbay, and it didn't seem like a wise investment. 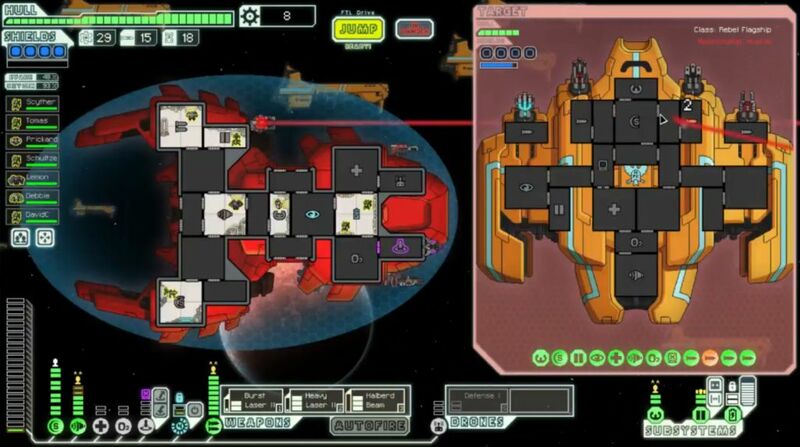 Plus, I would have needed to drop the Halberd Beam to take the Small Bomb, and that just didn't seem wise. I went for a more conventional strategy of targeting the flagship's Shield unit. 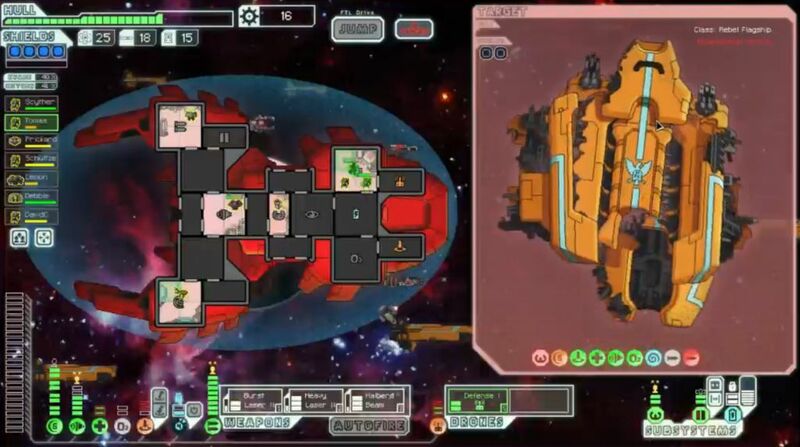 Although I wasn't always able to get through the flagship's shielding with just the total of five shots from Burst Laser II + Heavy Laser II, my defenses were almost impregnable and this first phase was easy. The Mantis A took all of one point of damage and never broke a sweat. The second phase did not start out in promising fashion. My initial volley of shots did almost no damage at all, with the Halberd Beam managing to hit for a mere two damage. On their end, the flagship's first missile barrage managed to hit my shield unit and set it on fire, which was a terrible stroke of luck. It's quite difficult to vent the shield and weapon rooms on the Mantis A, and until I put that fire out, the shield unit would continue to take system damage. My second volley did even less than the first one, not even managing to break two shield bubbles for a Halberd Beam shot. And then the flagship's boarding drone landed in my own Drone Control room, which would quickly do enough damage to knock out my Defensive Drone. All of my Mantises were still busy trying to put out the fire in the shield room, leaving no one free to fight that boarding drone. (Great as they are at fighting, Mantises are terrible at repairing or fighting fires.) My position was actually extremely critical despite having taken only a single point of damage thus far! Right about this point, about to lose shields AND defensive drone coverage, I realized that I needed to get the heck out of here. Fortunately I was fighting the rebel flagship right next to the Federation base. I could hop over to the base, patch up all of the damages, and then select the "Wait" option without any real problems. This tactical retreat / cowardly evasion worked like a charm, and when the rebels arrived a few minutes later, the Mantis A was fully repaired and ready for more action. During the repeat fight, I had the exact opposite result from the random number generator (RNG). This time, instead of all my shots missing, they all hit instead - ALL of them. The first four lasers knocked out the four rebel shield layers, then the fifth Heavy shot nailed their shields, followed by the Halberd Beam cutting through for another two system damage to four different rooms. Just like that, their defenses were almost completely gone. This time none of their missiles hit any important systems, my second volley cleaned out their shielding completely, and I won the battle mere seconds later with the third shot from the Burst Laser II. Absolutely incredible swing in randomness there. I played the fight in identical fashion, and the first time had about the worst result possible from a luck standpoint, and the second time about the best result possible. What a difference! At this point, a SECOND tactical retreat looked like an appealing option. The rebel crew on the flagship does not revive between phases, and if you jump away to another beacon and take their crew with you, killing them out in space, they still don't come back to life. I was able to jump back to the Federation base, removing the Mind Control from my Mantis, and then wipe out the remaining rebel marines on board. This also allowed for a repair to the Door system, which is critical to maintain against any kind of enemy boarders. Now keep in mind, the flagship does start each phase with full health if you run away after damaging it, but the rebel crew stays dead. With everything restored once again, and the hull still sitting at a robust 26 HP, I could now return to battle once more, clashing with the rebel flagship for the fifth time. Not even close in terms of hull damage, still 21 health remaining. Cloaking and the Defensive Drone make such a huge difference. This flagship duel was noteworthy for the two tactical retreats, without which the situation might have fallen apart very rapidly. I could see that things were rapidly approaching one of those disastrous cascades where one system after another falls in succession. Getting out twice to make critical repairs turned what could have been a life and death situation into a fairly routine ending. The final score managed to make my top five list, and one of my relatively few runs to score above 6000 points. The score seems to be heavily based on scrap collection, and the bonus from eliminating enemy crews with the Teleporter helps a lot. (The other top-scoring ships here are Stealth designs, which start with Long Range Scanners and therefore can see all of the encounters on the map.) 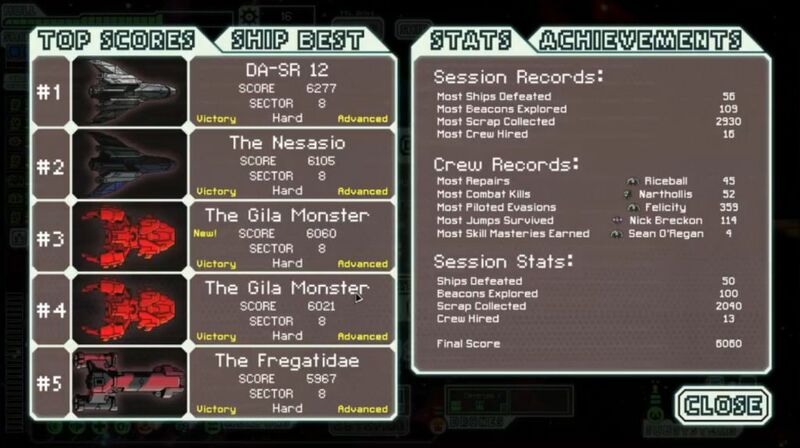 I played out five different runs with the Mantis A while going for this victory, winning two of them (one of them offline) and losing the other three. But amongst those losses, one of them came against the flagship itself, while another one happened because I misread the map and got caught by the rebels in Sector Two, having to fight them four times to escape. That was a sure death sentence as you might imagine. As best I can tell therefore, my win rate with the Mantis A is pretty close to 50%, which feels right for an average ship on Hard difficulty. Mantis B will be next on the list, and it's one of the strongest ships in the game. Thanks again for reading.